SOME OF THIS, SOME OF THAT: Students check out a booth at the fair. March 14, 2006 | The nutrition and food science department had its annual Nutrition Expo on Friday. 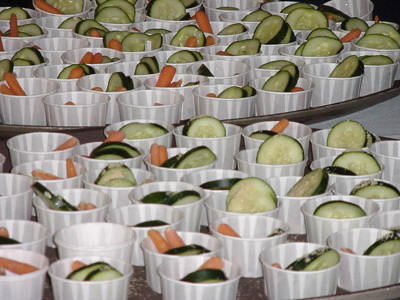 The idea was make students more aware about different aspects of nutrition they wouldn't normally think about. "It's hard being a college student. One of the main focuses here is to educate college students on how to eat healthier," said Joni Moore, a junior in nutrition and food science. 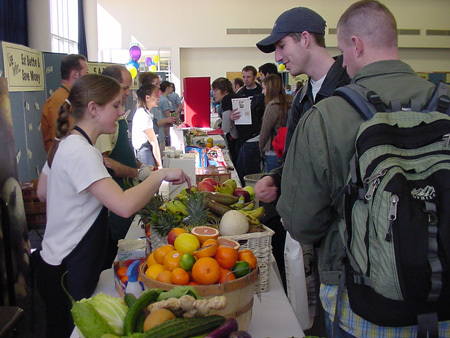 The expo was a project for juniors and seniors in the Nutrition and Food Science Department. It gave them experience in teaching and demonstrating healthy living. Several booths were set up. Each was designed to answer various questions about nutrition and wellbeing. Some booths featured ideas such as how eating healthy food is cheaper and how tap water is just as good for a person as bottled. "You'd think that easy foods like Hot Pockets would be cheaper, but they end up being more expensive in the long-run. I didn't think that. I was always scared to buy fruits and vegetables because they seemed more expensive," Jamila Islami, a USU freshman said. Other booths displayed research regarding dietary supplements and how food should be stored and kept. One showed how a person can feel fuller with fewer calories. "No matter what booth I went to, everyone had answers for my questions," Islami said. She said she learned what type of exercise schedule was best for her and what kind of an eater she was. "They had fliers on how to become a better eater. Eat when you're hungry, stop when you're full. I have the hardest time with that," she said. Handouts were available at every booth so students could take nutrition tips and recipes home to incorporate into their lifestyles, Moore said. There were free blood pressure and glucose screenings. Information about eating disorder prevention and prenatal prevention was also available. Food demos and samples were given. The 90/10 Rule was stressed. Moore said 90 percent of the time, people should strive to eat healthy foods like whole grains, fruits and vegetables. And the other 10 percent, she said they should eat whatever they want. "If you want to have a piece of cake every two weeks or once a week, eat that piece of cake and enjoy it. Don't restrict yourself all the time," Moore said. People should also exercise as much as they can. At least 3-5 times per week for 30 minutes is recommended. Moore said exercise is very important because it reduces the risk of many chronic diseases. It helps build lean body mass and assists in revving up one's metabolism, she said. "Pretty much any activity is awesome. It can be anything you want. Make time to do it," Moore said. She said eating and exercising in moderation is key in mastering a healthy lifestyle.